"Social media monitoring, engagement, publishing, analytics & customer experience management. All on one unified, easy-to-use platform." 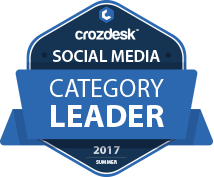 Falcon.io scored 89/100 in the Social Media category. This is based on user satisfaction (89/100), press buzz (44/100), recent user trends (rising), and other relevant information on Falcon.io gathered from around the web. Falcon.io is a software-as-a-service (SaaS) platform designed for social media marketing and customer experience management. It is a unified software solution tailored for freelance professional marketers, small- and medium-sized businesses, marketing agencies and enterprises. The service offers features used for social media engagement, social media listening, content publishing, analytics and customer data management. With these robust features, marketers and businesses can effectively market their products/services, provide personalized brand experience, pique the interest of their target audience and grow followers on social media. Marketing teams and businesses using Falcon.io are able to provide better and more personalized brand experiences to their target audience across different social networks. The solution allows businesses in different industries to effectively explore the full potential of digital marketing, social media marketing and advertising by having the ability to manage multiple customer touchpoints in a single robust platform. Additionally, Falcon.io also enables brands to deliver engaging and more personalized content that is relevant to their target audience, based on enriched customer profiles. It comes with a highly intuitive user-interface that is both collaborative and complemented by support and consultancy services across-the-board. Social Media Monitoring – Offers real-time social listening, customer search queries, sentiment analysis and high activity alerts. Social Media Management – Comes with single multi-feed inbox for all networks, priority and sentiment ranking, easy routing and task assignment, customer filters and bulk actions. Social Media Publishing – Allows users to create, schedule and preview social posts. It also comes with a content pool, cross-channel campaign planner, responsive campaign page builder and ads for Facebook and Instagram. Social Media Analytics – With this feature you can gain all kinds of functions, including unlimited reporting, benchmarking, paid, owned and earned performance analysis and a URL tool for more effective tracking. Social Customer Relationship Management (CRM) – This feature comes with enriched customer profiles, custom filters, profile segmentation and dashboard overview. With Falcon.io, you can create professional content that is engaging and relevant to your target audience. Using their content calendar, you can build paid and organic posts for all your social networks using a robust and collaborative platform. Features like Publish Content Calendar make managerial tasks and processes easier and more time-efficient, whether you’re managing teams, social channels, workflows or social media campaigns. Also, features like approval flows and content pool helps to ensure brand alignment and high-quality content. Manage social channels and moments more effectively. Community management, engagement and customer support can be stressful and time-consuming, especially if you’re juggling multiple social networks. But this doesn’t have to be the case. With Falcon.io, you get one social inbox, a single location where you can manage everything more efficiently, from customer data management to engagement and prospect monitoring. Bolster your social media campaigns with more accessible and comprehensive data. Identify your target audience and get a sense of their sentiments and passion with social listening, while you monitor content performance. Integrate social data with CRM solutions for a more comprehensive view of the customer information you’re getting. With Falcon.io, you can manage all customer interactions and store all their public data in one location with enriched individual profiles. You can then aggregate those profiles and use them for highly target segmentation. Pricing packages and services for Falcon.io social media software solution are specifically tailored to meet the varying needs of companies and marketing professionals. They offer three social media solutions to facilitate your team’s needs. All subscription plans come with unlimited channels, teams and reports. Premium Package – Contact vendor for quote. Designed for enterprise level teams. Features, services and capabilities are specifically tailored to meet your social media marketing and management needs. Pricing is determined based on the number of teams, users, mentions and other factors. Extra support and advisory options. 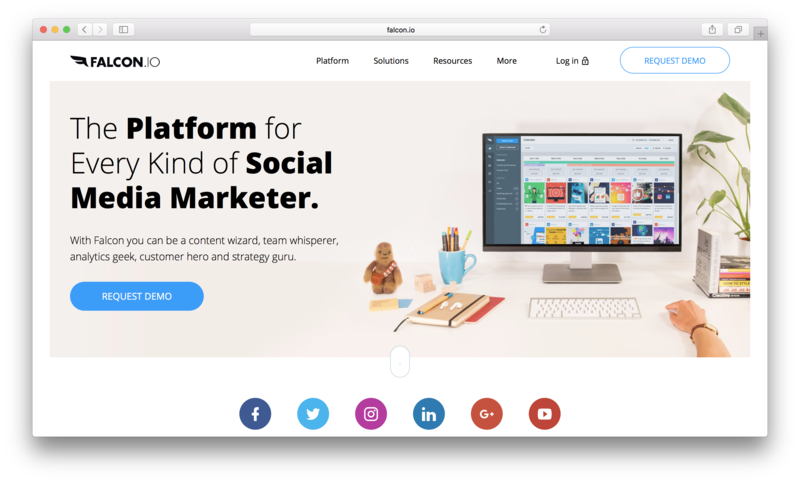 Falcon.io is a unified social media marketing and management software solution designed for small- to medium-sized business and enterprise-level organizations. It comes with unique and highly functional features that facilitate multiple social media processes. The pricing is a bit high-end. So it’s important that before you commit to a subscription plan for Falcon.io, you need to assess your company’s needs and resources to see whether or not the service is a right fit for you. Who are the main user groups of Falcon.io? Does Falcon.io offer guides, tutorials and or customer support? What are some applications Falcon.io is commonly used in tandem with? Does Falcon.io integrate with any other apps? What platforms does Falcon.io support? Does Falcon.io offer multi-user capability (e.g. teams)? Does Falcon.io offer an API? What is Falcon.io generally used for? 4.45/5 based on 26 user ratings. We are working since autumn with Falcon and are very satisfied with it. We are scheduling our postings, working with the commands and using it for reportings. The different categories are mostly intuitive. The lists could be more simple to organize. But the support is quick an excellent.